Cut off the crust from bread slices and cut them into small cubes. Pour the olive oil in a deep bowl and add finely chopped garlic. Season with salt and pepper and mix well. Add the bread cubes to the bowl and mix with both hands thoroughly, making sure the cubes are well coated in oil. Following this stage, the croutons should be baked immediately. 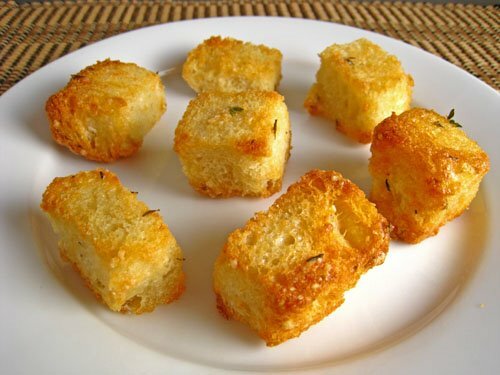 Place the croutons on a baking tray and put the in the oven for 10 minutes. Remove from the oven and leave to cool down. The garlic croutons can be kept in an air tight container in a dry place for 1-2 days. Serving suggestions: serve in salads, soups and as a snack with beer.